This summer as an intern at the Archives, I have been working on revamping our online exhibit about postcards featuring the Smithsonian. The most challenging part for me has been determining the dates of the postcards. Some of the postcards we have in our collections are used, so it’s very easy to give them a date. However, many of the postcards are unused. At first, dating these unused postcards seemed like an impossible mystery to solve. So, how have I been able to figure out a date or time period for all of our unused postcards? Well, we have a general knowledge of postcard chronology that can help narrow down dates to a certain time period. 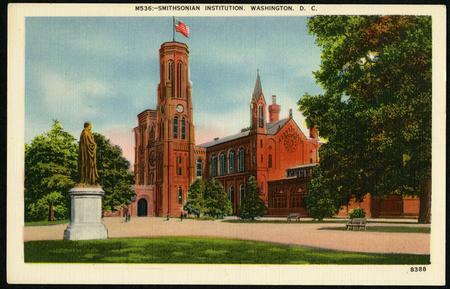 For example, I dated this postcard of the Smithsonian Institution Building to circa 1930-1945 because it is made of linen. Linen postcards were very much in vogue in the 1930s to mid-1940s, so we can use this knowledge to date the object. Another way I have dated postcards is by using context clues. Many of our older postcards have little to no information on the message side, but as the postcards become "newer," they tend to have information that can help date them. This postcard of Glamorous Glennis, Charles Yeager's plane, is a photochrome postcard. Photochrome cards date from around 1939 to today — a huge time period! However, using the information on the back, I narrowed the date range. Glamorous Glennis did not come to the National Air and Space Museum until 1950, so the postcard cannot be from before then. In addition, the message side says "National Air Museum." The National Air and Space Museum did not take on its present name until 1966, prior to which it was known as the National Air Museum. So, the postcard cannot be from after 1966. With these context clues, I narrowed the postcard's date range to circa 1950-1966. 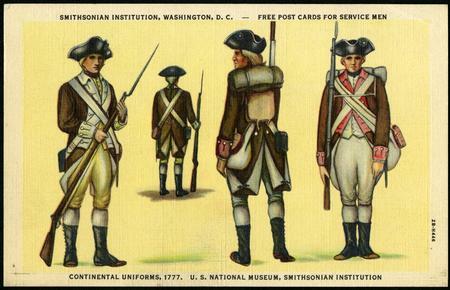 I also used context clues to date this unused postcard of Continental uniforms from the Revolutionary War. The postcard is made of linen, so the initial date range for it is 1930-1945. However, the card provides us with a great clue for a better time range: it says "Free Post Cards For Service Men." This postcard had to have been produced during World War II, so I narrowed the range from 1930-1945 to 1942-1945. In fact, using my most exciting find, I was able to date the postcard of Continental uniforms to its exact year. What was my most exciting find? Well, many of the postcards in our collections were made by Curt Teich & Co., and as you can probably guess, they are unused. When researching Curt Teich & Co. for information about its production of postcards, I found the Curt Teich Archives, and they used postcards and documents from the Teich family and the company to compile a dating guide! The guide allows me to give more definitive dates to our many Curt Teich postcards. For example, the postcard of Continental uniforms was actually produced in 1942. On the right side of the front of the card, the print number "2B-H446" gives us all the information we need: the B tells us 1940s, and the 2 tells us specifically 1942. In addition, the H indicates that the postcard is a linen card. The 446 is the card's number: it was the 446th unique card produced in 1942. Using the dating guide, I have been able to date all of our Curt Teich postcards. After finding the guide and dating our Curt Teich postcards, another question about their printing origins came up — we have postcards that are almost duplicates, but not quite. They have the same image and the same print number, but their backs are slightly different. 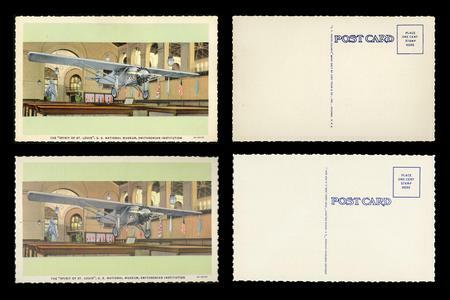 For example, we have two Curt Teich postcards of the Spirit of St. Louis plane hanging on display in the Arts and Industries Building. They both have the print number 4A-H2181, which tells us they are linen cards produced in 1934. So, why the different backs? I learned from the Curt Teich Archives that in this case, the different backs mean that the postcards were most likely ordered at different times. So, as it turns out, the print numbers can only definitively tell us the initial print date and not if a card was reproduced later, but it is still an excellent way to give all of our postcards dates! Unfortunately, we have many postcards that were not produced by Curt Teich. These postcards, such as those made by the B. S. Reynolds Company and Capitol Souvenir Company, also have print numbers, but I haven't been able to find any information on their printing systems. However, I am always on the lookout for clues to help me unravel the Mystery of the Undated Postcards — please feel free to comment if you have any helpful information about the postcards in our collections!